Caesar Guerini shotguns are very prestigious in the weaponry world, simply because they perfectly combine all the performance elements any gun enthusiast would come to expect from a top-of-the-range brand. Boasting the most elegant designs, Caesar Guerini shotguns are intricately decorated with beautiful metal work and stylish polished wood, showcasing a very recognisable appeal, without compromising the performance ability. Caesar Guerini shotguns are available in two main styles - the semi-automatic, or the over and under double barrelled shotgun. Browse our extensive range of new and second hand shotguns for sale today and be sure to find the right product for you. Mint condition and lightly used. Fully adjustable rib, adjustable stock, makers case, full set of extended chokes and key. Only shot 500 Cartridges as new! THIS IS THE "M" SPEC" VERSION OF THE INVICTUS 1. Adjustable stock and rib. Weight as per standard specification. The Gun Room offers you the opportunity to purchase a second hand Caesar Guerini Tempio with 30" barrels choked Cylinder and 1/4. Comes cased. 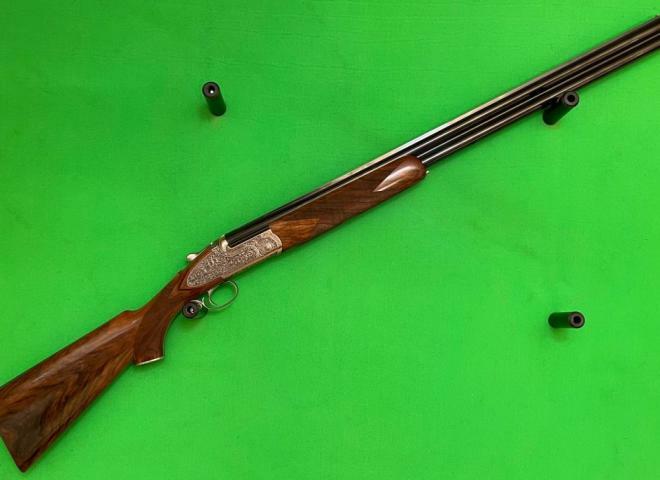 Rare and stunning gun with a full sett of chokes plus 2 brand new 3/4 extended ones.It is just stunning to look at with a perfect curved action and engraving,markless stock but the barrels have a few marks on them superficially. Lovely game gun, hardly been used only selling due to using the 12g more than this 20g. Comes with a selection of chokes and plastic case. Reduced in Price... Great Bargain! This gun is like new and comes with a full set of 8 chokes. As new condition, having fired less than 100 cartridges, unwanted gift for an ex-girlfriend now for sale. All original box, chokes, paperwork and tools etc. The Gun Room offers you the opportunity to purchase a second hand Caesar Guerini Magnus Sporting with 32" multi choked barrels. With game scene engraving. Comes with case. In good condition. All ready for the 2019 season, this high rib Summit trap is in very nice original condition with all chokes and cased. If you haven't tried one you should! Superb example with highly figured rounded pistol grip stock and matching forend, solid narrow game rib, manual safety catch, flush fitting chokes, ABS travel case incl. Caesar Guerini Summit Ascent fixed mid-hight Rib. A great all-round gun. 32in barrel and the stock as not been altered. Adjustable stock and trigger. The gun is in great condition as I haven't had time to use it much since buying it. Brand New!! Great price !!! Caesar Guerini Invictus V Ascent Sporter. 12 Bore. 32" Barrels. 2" 3/4 chambers. Ventilated top and side ribs. Higher top rib. Matt black finish on barrels. Multi chokes. Caesar Guerini Summit Ascent Sporter. 12 Bore. 30" Barrels. 2" 3/4 chambers. Ventilated top and side rib. High top rib, Matt black finish on barrels. Multi chokes. Caesar guerini apex sporter, very little use, immaculate condition, makers case, 8 factory multi chokes, adjustable trigger,bargain against a new one (full new price is now £5125, THIS ONE IS £3000. AND LESS THAN 1000 CARTRIDGES FIRED. Caesar Guerini has created the Invictus. Featuring the greatest advancement in over-under durability in many years – the Invictus System. The Magnus Sporting has a beautiful game scene engraved sideplate, Pistol Grip Sporting Stock, Scnabel Forend, Ventilated Sporting Multichoke Barrels. Maxum Sporting has a striking deep scroll engraved sideplate, Pistol Grip Sporting Stock, Scnabel Forend & Ventilated Sporting Multichoke Barrels. The Summit Sport now has a fresh new look with a sleek black action, Pistol Grip Sporting Stock, Schnabel Forend, Ventilated Sporting Multichoke Barrel & Non Auto safe. New Caesar Guerini Summit Ascent in black. Ideal sporting clays gun with an adjustable comb and mid height rib. This model has a huge list of features and wins at the highest level. All Caesar Guerini models stocked. Pre owned Caesar Guerini Magnus jaspe 12 gauge over and under with case hardened game scene engraving. Still in the makers case with all accessories. In tidy condition C/W 3 spare chokes & makers plastic case. 12 bore . Single trigger. Selector. 32 " barrels with multi chokes. ventilated top and side ribs. Full pistol grip with palm swell for better grip. Factory flush chokes + two extended factory.